← The 4th Qtr. 2015 NYCentral Modeler is Here!! 4th Qtr. 2015 Central Headlight in the Mail!! The 4th Qtr. 2015 Central Headlight is here. 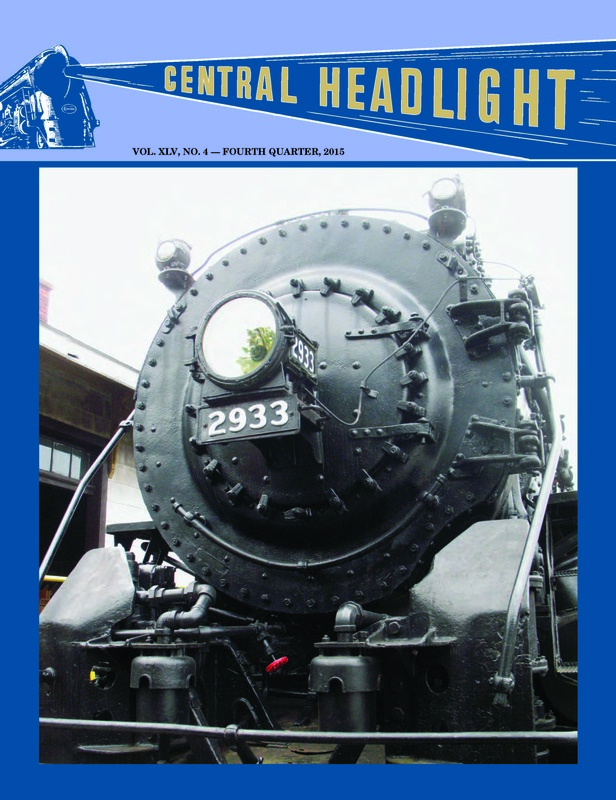 A big, 48-page Fourth Quarter 2015 issue of Central Headlight has been mailed to all members in good standing on Tuesday, November 10. It is an issue not to be missed. The lead article pays tribute to New York Central’s L-2d Mohawk 2933, one of the only two modern NYC steam locomotives to survive the torch, and the only modern steam locomotive ever donated anywhere by the NYCS. It tells the true story of how this locomotive came to be saved, and discusses the full cosmetic restoration currently ongoing at the Museum of Transportation near St. Louis. Next comes a thorough discussion of the purpose, facilities, and operation of the Robert R. Young Yard, New York Central’s huge classification yard at Elkhart, Indiana. A four-page pull-out centerfold reproduces in full size the detailed plan of the yard prepared by the Signal Department of the NYCS in September 1957. Detailed information about arrivals and departures on a typical day in 1964 is provided. The third major feature is another wonderful photo essay by NYCS veteran Jeremy Taylor. Jerry’s first photo essay, published in Central Headlight just one year ago, was widely acclaimed, and this second essay is its equal. Twenty-two outstanding photos, each captioned by Jerry himself, transport readers across the transition-era New York Central System from eastern Massachusetts to western Indiana. If you are not yet a member of the NYCSHS, the good news is that we have printed a limited number of extra copies of this outstanding issue just for you! Don’t miss out! Visit our on-line Collinwood Shop today and join as a member for 2016. Click here to download membership form to mail in to join! Click here to renew your membership for 2016 by mail. We’ll send you a copy of this Fourth Quarter 2015 issue by first-class mail as soon as it is off the press, and you will also receive all four of the 2016 issues of our magazine that will come automatically with your membership. Don’t delay. Act today! For NYCSHS members, now is the time to renew your membership for 2016. This issue of the Central Headlight is the last one you will receive if you don’t renew. Renewal forms are in this mailing of the Central Headlight. Don’t put off renewing or you will miss out on all of the benefits of membership. The renewal form is stuck to the front of this edition of the Central Headlight. Mail it in as soon as you get the mailing or better yet go to the NYCSHS Collinwood Shop and renew. Click here to renew your membership in our store for 2016. This entry was posted in Central Headlight, Members Information, NYCS News. Bookmark the permalink.